Matt Adams - Superheroes, Sci-Fi, and a Touch of the Fantastic: Bounty Hunter Anthology now available! 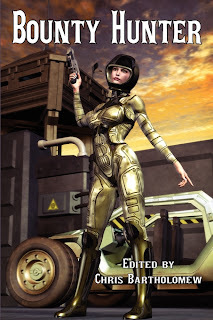 The Bounty Hunter anthology from Static Movement is now available. It includes my short story, "No Errors in Programming." Chris Bartholomew edited this collection of bounty hunter-themed tales. A quick summary: Robot bounty hunter Molitor (Mobile Operation Licensed for Infiltration, Termination, Observation, and Reconnaissance) never compromises in tracking down its quarry. But when the machine accepts a contract to terminate a member of a well-known royal family, certain parameters don't compute, forcing Molitor to recalculate the best course of action. You can get it here or by clicking the cover image below.